"What a delight! The two routines I loved the most were "coin bending #1" as well as "transposition". Both of them combine multiple levels of deceit and the result is very visual, mysterious and, to be honest, I like them the most because they are rather quick, impressive and as Tamariz used to say "it leads the mind of laymen to continuous dead-ends" while trying to "solve" the mystery. Voila!... Some other routines, like coin to glass and coin to matchbox don't exactly fit my style but their characteristics tempt me to try them because again they are very visual and will hit hard the audience. The basic move is not alone - alternatives of the basic move as well as some other nice moves and subtleties make the video very complete and concise. And if you, like me, chase like mad routines where you end clean, then again Bingo - all moves enable you to do that and you won't regret it. Now, the video quality is indeed an MTV one which puts some energy into it and some people will like (especially younger people) while some other may not (so they will get a bit dizzy while watching it!). 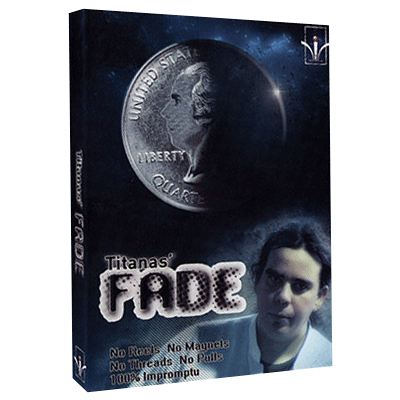 But if you buy something for the ingredients and not for the packaging, then "Fade" is for you and you won't regret it - all routines, moves and subtleties are worthwhile and you will apply them very soon with magical results..."
"I just wanted to give you guys my two cents worth on Fade. The Principal that is taught on the video is very usefull and I am sure that just about everyone will use this. The teaching is clear and consise, and the video quality is good. The video is short but by the time your thru watching it you will be able to do Fade with no problems. If you can use what you see in the demo then that's what you will get and I wouldn't read any more into it than that. Thanks Tiatansgr for bringing a good principal back into the light...."
Many routines found their way in this video, anything from simple vanishes of a coin to some more elaborate coin change or even a coin to matchbox effect. "Well I must say that after reviewing the Fade video that I am very impressed with the overall production. The video is of high quality, and the explanations are clear and straight to the point. The basic move is very deceptive and pleasing to the eye. The coin simply vanishes with no awkward moves or any tells what so ever. There are many applications that are taught, with cool coin bending effects. Fade is so deceptive all avenues that your spectator will try and go down to figure out how you vanished the coin will be met with a dead end sign. My favorite routines in this video are the Transposition and Coin to Glass. The multiple uses for Fade are mind-boggling. There is also a way, if you put your mind to it, to do a coins across on your knees (you will see when you get the video). This is not mentioned on the video, it's just this video will get your creative juices flowing, like it has done with me.